Traditionally Hand Peeled & Pickled in a Rich, Malt Vinegar. The ultimate taste & crunch. Suitable for vegetarians and vegans.The connoisseurs' pickle. 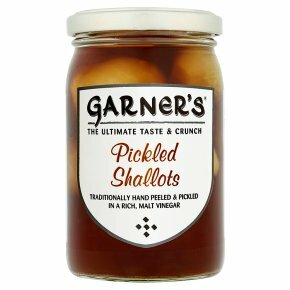 Delicious piquant shallots with the distinctive Garner's crunch. Try sliced with Goat's cheese for the ultimate cheese & pickle sandwich.